Wells Nursery was founded by Harold and Nina Wells in 1937. As a third generation family run business we are constantly evolving with the needs and wants of the nursery industry. From our first plant introduction Chamaecyparis obtusa ‘Hinoki King’ in 1950 to our ever popular Cornus kousa koreanisis ‘Ruby Slippers’, introduced in 1997, we continue to seek out and develop new plant varieties that our customers have grown to expect. Our retail division is open to the public all year long. 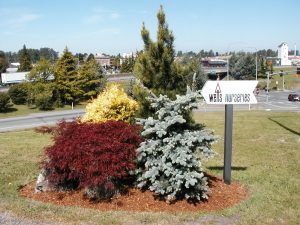 Located along I-5, exit 226, in Mount Vernon, WA, we offer a large selection of the grafted conifers that we grow, a great selection of Japanese Maples, plus hundreds of other trees and shrubs perfect for your home or professional landscaping project. Our retail location is also home to our propagation & production crew. For the trees that we field grow, this is where life starts. Our wholesale division is open to Nursery & Landscape professionals by appointment only. 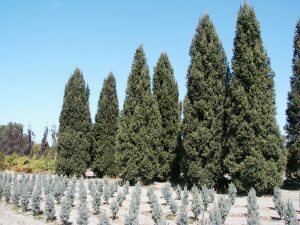 Conifers grown in Mount Vernon are shipped to the Rocky Mountain States, the Mid-West and areas along the East Coast. Many of these plants are Wells Nursery Introductions. These plants were discovered, propagated and introduced to the nursery industry by us. We are currently growing on over 100 acres located in the Skagit Valley of Western Washington.